Signed, sealed, delivered: Stephanie Roche. 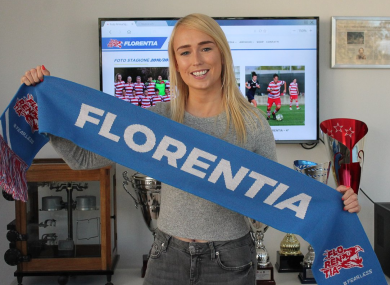 ITALIAN SERIE A side Florentia have announced the signing of Ireland striker Stephanie Roche. The 29-year-old told The42 that she had sealed a move to Italy last month, but could not reveal the name of the club as she was awaiting international clearance and registration to process, while her new employers wished to make the announcement themselves. Roche has had a nightmare year of injuries but has since put those woes behind her, striking a new deal in mainland Europe after parting ways with Sunderland. The Dubliner suffered a fracture to her tibia in Ireland’s opening European Championships qualifier against the North last September and she faces a major set-back in January as she returned to training and a stress fracture to her medial condyle was discovered. She got the all-clear to return in August and is now back to full training and plying her trade in Italy. “It’s a different challenge for me again,” she told The42 last month, as she shared the news of her next career move. “It’s a good league and good clubs involved. I’m just looking forward to it. Going away is definitely showing that I still want to play for Ireland. Prior to that, she played with French outfit ASPTT Albi and Peamount United in the Women’s National League (WNL). “I’m very happy to have arrived at Florentia,” the 2014 Fifa Puskas award runner-up told the Florentia club website today, as translated by the BBC. The Florence-based club are currently in fifth place in the Italian Women’s Serie A after six games this season, and are six points behind leaders AC Milan. Email “It's official! Goal-hungry Ireland striker Roche's move to Serie A fully confirmed”. Feedback on “It's official! Goal-hungry Ireland striker Roche's move to Serie A fully confirmed”.